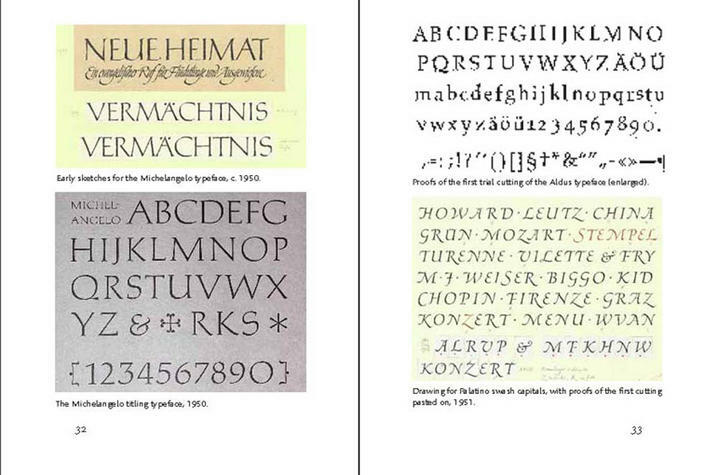 Depiction of types by Hermann Zapf in "About More Alphabets: The Types of Hermann Zapf" by Jerry Kelly. LEXINGTON, Ky. (Nov. 2, 2018) — On the 100th anniversary of the year of Hermann Zapf’s birth, the University of Kentucky Libraries Special Collection Research Center and the King Library Press will present the eighth Hammer Lecture delivered by award-winning book designer Jerry Kelly. The lecture, “Hora Fugit – Carpe Diem: Hermann Zapf on His Centenary,” will begin 7 p.m. Friday, Nov. 9, in the Great Hall in the Margaret I. King Library Buildling. Kelly’s talk, and a pre-lecture reception scheduled for 6 p.m., are free and open to the public. The Hammer International Book Arts Biennale was established in honor of Victor and Carolyn Hammer and their legacy to fine printing. Every other year a distinguished scholar or book artist of international reputation is invited by the King Library Press to lecture on printing, typography, illustration, book-binding, graphic design or other aspects of book arts. An endowment fund has been established through the King Library Press, founded by Carolyn Hammer in 1956, which strives to continue the fine press tradition of Victor and Carolyn Hammer. This year's lecturer is an internationally known book designer, calligrapher, type designer and typographer. Since 1978, Jerry Kelly has been a partner at Kelly-Winterton Press and the Nonpareil Typefoundry, an independent type design firm. His career in book design began with the Press of A. Colish in Mt. Vernon, New York (1981-1991), and then at the Stinehour Press in Lunenburg, Vermont. Kelly has received numerous awards, including more than 30 selections in the American Institute of Graphic Art's prestigious Fifty Books of the Year awards for excellence in book design. Kelly, a student of Zapf, was the 28th Rochester Institute of Technology Goudy Award-winner. The King Library Press, founded in 1956, is devoted to the tradition of fine printing and produces books and broadsides. Typesetting, printing and binding are all done at the press and there are opportunities for apprentices. The press is in the King Library Building on the UK campus.